Michael Woods was all in with [Jd][Td] on a [6d][8h][7d] flop against the [8d][6c] of Matt Miller. Michael needed a diamond or a nine to win. When the turn fell [Tc], Michael picked up additional outs and now also could catch a ten or a jack to make a better two pair, although a nine would now chop the pot. It was not to be however, as the [2s] fell on the river giving Matt the winning hand. Michael will collect $12,000 for his efforts. 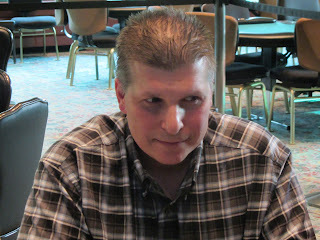 Kurt Martineit has been eliminated in 3rd place when his [Kc][9h] failed to improve against the [Ah][Ks] of Matt Miller. Kurt will earn $12,000 for his efforts. Michael Hansen has been eliminated in 4th place when his AJ failed to outrace Kurt Martineit's [5s][5c]. In the photo above, Michael reacts to Kurt turning quad fives to leave him drawing dead. Michael will earn $12,000 for his efforts. 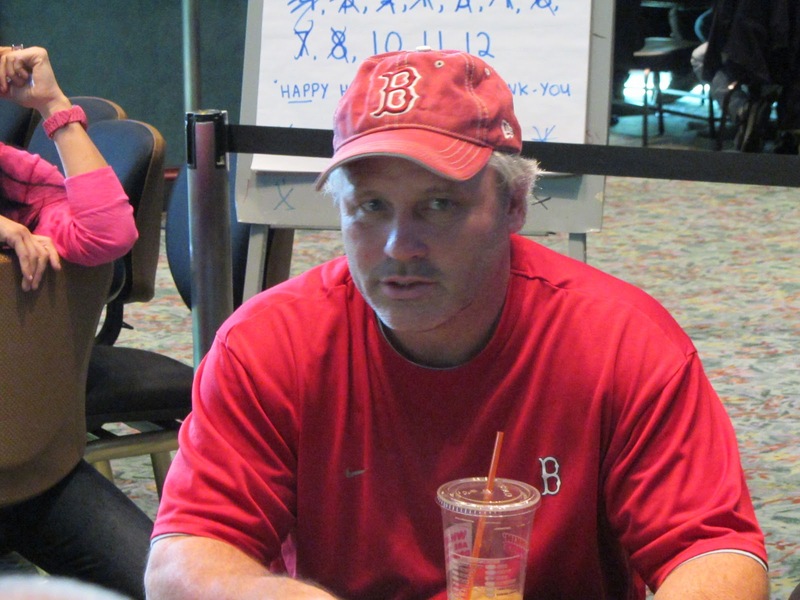 Mike Nye has been eliminated in 5th place when his [Ah][9s] failed to improve against the [Qd][Qc] of Matt Miller. Nye will earn $5,514 for his efforts. 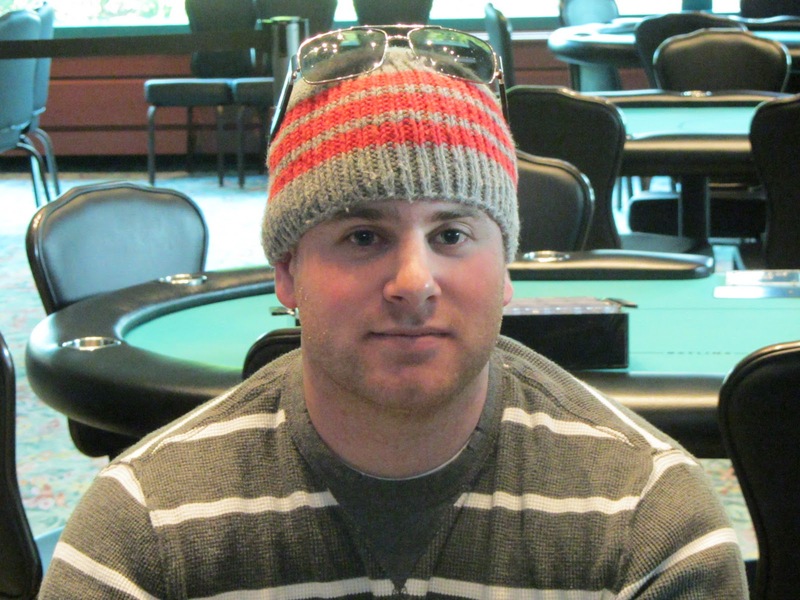 Kyle Loman has been eliminated in 6th place when his [9s][9c] failed to hold up against the [As][Kd] of Kurt Martineit. Kurt is shown above shaking Kyle's hand upon his elimination. Kyle will earn $4,480 for his efforts. Kurt Fitzgerald has been eliminated in 7th place when his pocket nines were cracked by Kurt Martineit's pocket sevens. A seven came on the flop, and Fitzgerald never improved. He will collect $3,741 for his efforts. 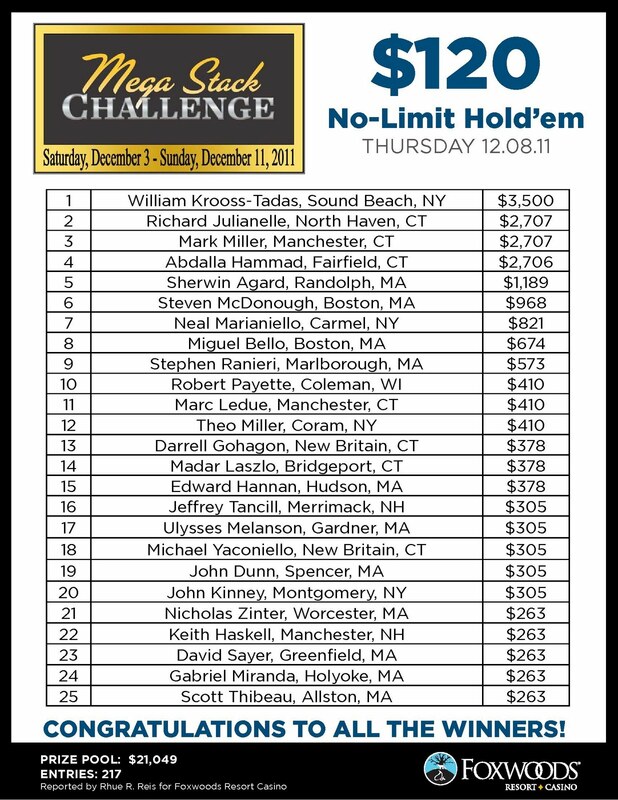 Here are updated chip counts on the break of the $400 Mega Stack. The remaining 7 players are now playing 15,000/30,000 blinds with a 5,000 ante. 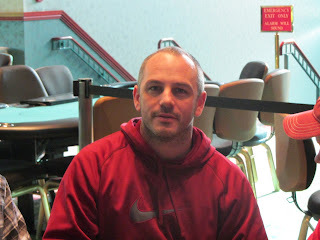 Michael Defalco has been eliminated in 8th place. He will collect $3,052 for his efforts. 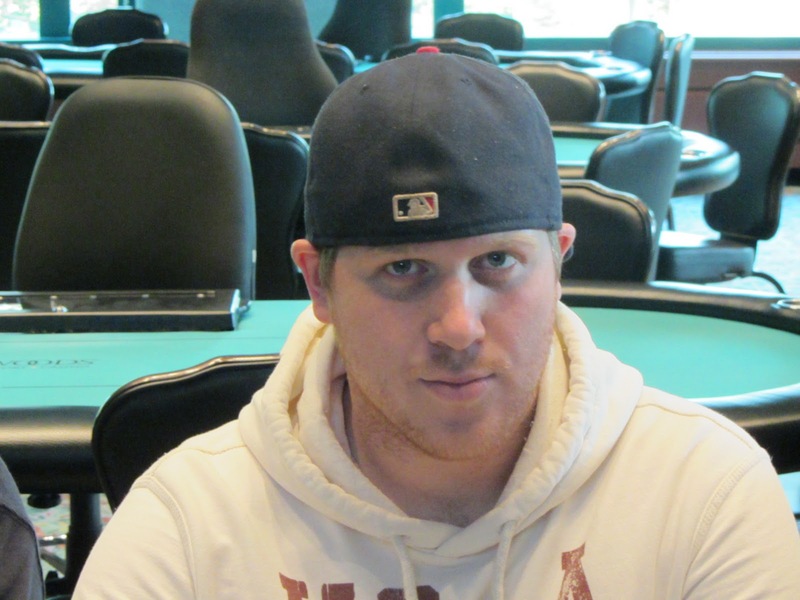 Kyle Loman started this final table last in chips, but after a few double ups, he finds himself in contention with 8 players remaining. Kyle was recently all in with [Ad][9d] vs. Matt Miller's AQ, but Kyle turned the nut flush to double up. He now sits on a stack of approximately half a million. 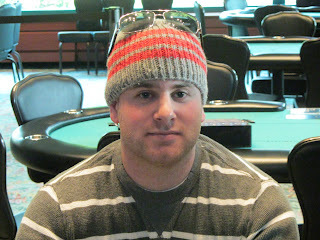 Eric Marowitz has been eliminated in 9th place when his AT was outflopped by Kyle Loman's [Ks][Qs]. Eric will earn $2,567 for his efforts. Peter Campo has been eliminated in 10th place when his Q8 failed to improve against Kurt Fitzgerald's 22. Peter turned a flush draw and still had two overs, but failed to hit his draw on the river. He will collect $1,870 for his efforts. 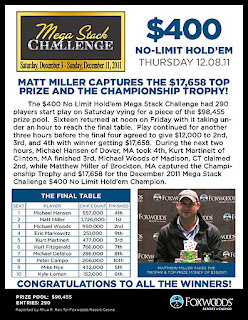 You can watch the live feed by clicking on Watch LIVE Feature Table at the top of this page. Day 2 is now underway in the $400 Mega Stack event. There are 15 players remaining, and the blinds are now 6,000/12,000 with a 2,000 ante. Play has come to an end on Day 1 of the $400 Mega Stack with 16 players remaining. The average chip stack is now 363,000. Play will resume at noon tomorrow and play down to a winner. 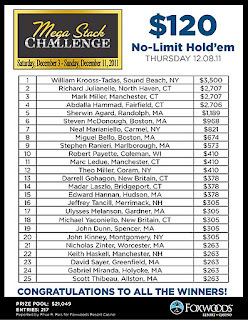 Final chip counts and Day 2 seat assignments will be posted momentarily.